Something bright and cheery for all the gloomy rain and clouds we've been having here! Accessories: Extra Large Fancy Flower Punch, Old Olive Ribbon, Top Note, Big Shot(you need this!! !, you know you want one!!! 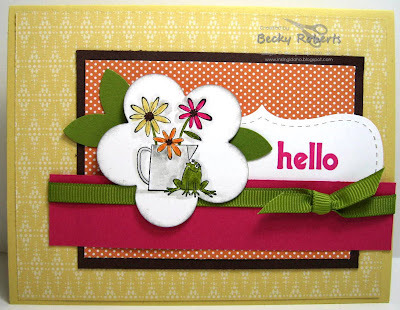 ), various Stampin' Up! Markers, 5-Flower Punch for leaves. Awwww...how sweet! Love the bright colors and that frog is just darling. gloomy rain and clouds .... you too? I bought out all the Daylight light bulbs Home Depot carries. I just can't take it any more. Your card design helps loads! Love the layout and the frog on the flower. Great idea! Loved the way you stamped the frog on the flower...I was inspired and stamped the tulip basket, layered with the Tropical Bigz flower etc...thanks for a fun layout to try and play with!